Company took part in the 8th International Exhibition Fair Agro Expo “Silk Road 2012”, acting as a co-sponsor of the event. 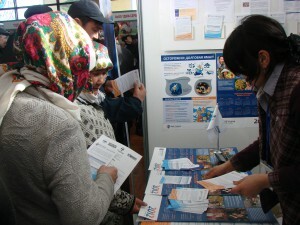 Exhibition-Fair was traditionally organized by the Association of Agrobusinessmen of Kyrgyzstan Jer Azygy in Osh. The event was attended by more than 40 companies and private entrepreneurs from different sectors of Agriculture and Processing Industry of Kyrgyzstan, the Netherlands, the USA, India and other countries. Diverse range of agricultural equipment, seeds, fertilizers, plant protection chemicals and other essential goods for the farmers was presented at the fair. In the framework of participation in the exhibition the Company conducted a technical workshop for the population “Support of agriculture projects. Leasing “, where the audience was provided with information about the conditions of obtaining the agricultural and other equipment at leasing, lending agriculture projects, as well as the possibility of placing deposits. Aziza Yuldasheva, the CEO of AAK Jer Azygy noted: “We have been cooperating with Bai-Tushum and Partners company for many years already. When a farmer needs fertilizers, seeds and other means of production and he is short of funds, then Bai-Tushum and Partners Microfinance Company comes to the rescue. Provision of the necessary funding by the Company is substantial support for farmers in developing their business”. Association of Agrobsuinessmen of Kyrgyzstan Jer Azygy is a nonprofit organization established in 2002, which brings together, represents and coordinates the work of producers, suppliers and distributors of means of production for agriculture in Kyrgyz Republic. This year the Association celebrates its 10th anniversary.